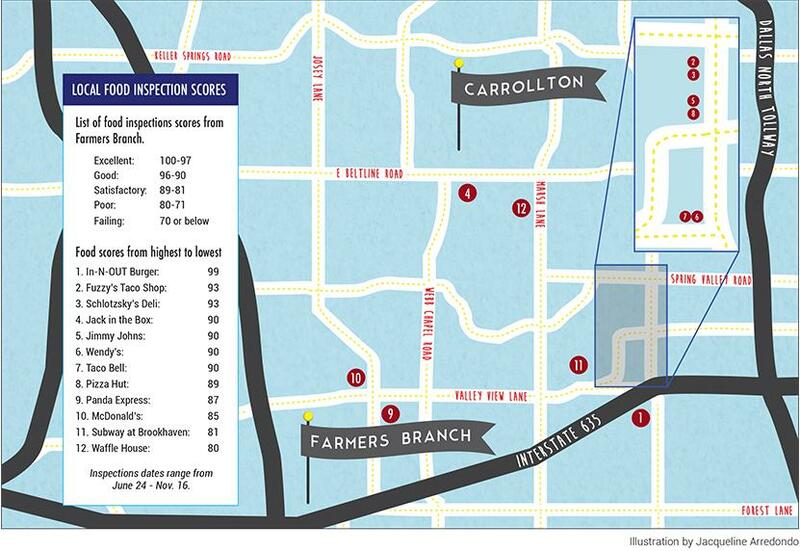 Food safety scores in city of Farmers Branch are based on a scale ranging from 0-100. Farmers Branch uses a system called the Texas Food Establishment Rules as well as the state inspection form that goes with these rules to inspect food establishments, according to farmersbranchtx.gov. The grading rubric for the inspection form goes over various items, equipment, sanitation as well as cleanliness of the restaurant. Convenience stores also undergo an inspection from the city. Convenience stores follow the same guidelines as restaurants. However, they are not graded as harshly. A full-service restaurant that prepares meals from scratch is involved in more complicated high- risk operations and processing than a convenience store selling only prepackaged food items, according to farmerbranchtx.gov. Sergio Gamon, a Brookhaven College student, said he prefers Chick-fil-A or Panda Express when eating in Farmers Branch. “I’d still go to the Jack in the Box off Harry Hines,” Genesis Lopez, a student said, after hearing that the restaurant received a poor score. While some students go off campus to find food, many said they go to the Subway on campus because it is the easiest choice. Food scores for Subway have declined in Farmers Branch food and safety score inspections. The Subway at Brookhaven had an average grade of 83 for the past year. The college’s Subway received a grade of 87 in December 2016, an 82 in April and an 81 grade in August, according the Farmers Branch website regarding food scores. Inspections are conducted according to a risk-based system. Subway is inspected about three times a year because the restaurant is not doing their own baking, said Louise Maranzana, the Farmers Branch food and safety inspector. Larger businesses are graded a different way due to the higher amount and different kinds of work. Nicholas Brown, the Subway manager said he has been inspected three times during his time as manger. He said he has been the manager for the past three months. The first time, failing, the second time, passing and Brown said he expects his grade to rise after a recent inspection earlier this month. Brown said he works during off days to clean the restaurant and do pest control. He said he also requires employees to maintain the cleanliness during work hours. There have been some concerns this fall with the food being served at the restaurant. Tim Heeney, franchise owner, said that Subway is privately owned and they cannot give information regarding management. While some restaurants near Brookhaven scores go either steadily higher and lower, there are some restaurants that do not have a rhythm. In November 2015, nearby Bay 34th Street Pizzeria had a score of 83. That score went up to a 100 in July, but received a 76 in November for problems such as inadequate hand washing by employees and chemicals placed near food items. The Wendy’s on Lyndon B. Johnson Tollway has kept up an average of 90 in 2015. More information about food scores and the details for the restaurant grades can be found on the Farmers Branch website.